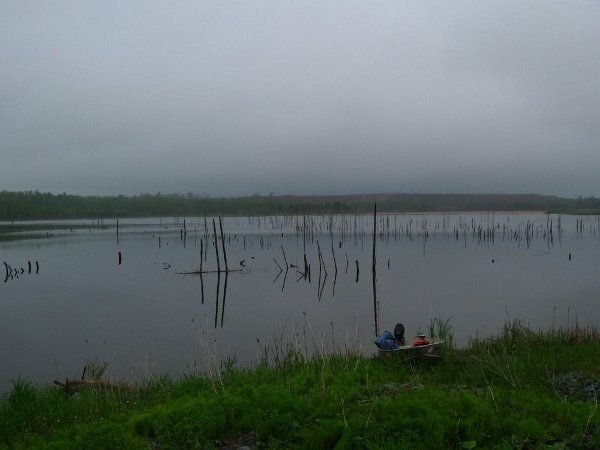 Over a two day period in June 2011, Tekmap Consulting used the SHLS to map a shallow tailings and polishing pond and pit. Depths in the tailings and polishing ponds ranged from < 1m to 4m. Depths in the pit ranged from < 1m to 51m. In total, over 200,000 soundings were collected using the SHLS. For this survey, a WAAS enabled Garmin Etrex GPS with 2 second accuracy was used to collect position information. Fugawi was used to navigate and to show approximate coverage. Data were processed using custom software developed by Tekmap Consulting. Overall the SHLS performed very well during the survey. The Humminbird sounder maintained accurate bottom detection even in very shallow water. Survey conditions in the 2 ponds was difficult with numerous navigation hazards (i.e trees and tree stumps). The survey results were used to calculate the volume of water at each site. In the case of the pit, the results were used to estimate time and cost of de-watering.